Just like unemployment is one way of illustrating the health of an economy, Purchasing Managers’ Index (PMI), Gross Domestic Product (GDP), and Capacity Utilization are the needles I watch to zero in more closely on the economic health of the manufacturing sector. I have learned to trust the economists and experts at MAPI and AMT. I’ve also added other links below that contain articles by reputable sources. So, here is a quick, high-level overview of what people are saying about 2015 in the manufacturing sector. Remember, forecasts are educated, forward looking guesses. In general, GDP for the world in 2015 is estimated to be up slightly over 2014 (2.9% to 3.4%, depending who you read) and that is good. In the pits of the recession that began in the last quarter of 2008, the world stopped growing – zero GDP growth was estimated, and the economies of nearly every country suffered – as did your business, most likely. I’m glad we’re no longer there. Both MAPI and AMT have good data on global GDP. I’ve also included a number of links at the end of this post from other industry sources. It is also important to note that data in “Industrial Production” is often more valuable to the waterjet shop than GDP. Discussion on industrial production is beyond the scope of this post. I suggest you refer to MAPI’s industrial economic outlook round-table discussion video for details. With global GDP you want to see a solid growth number (something above 2.75%), but also important, if not more so, you want your country and the world as a whole to be growing. When GDP is not growing then the manufacturing sector tends to go very conservative, and waterjet shops have more trouble finding work. I have a lot more data on the US, and so I’ll concentrate on the States from here on out as I run through other key economic indicators. I follow PMI and Capacity Utilization. 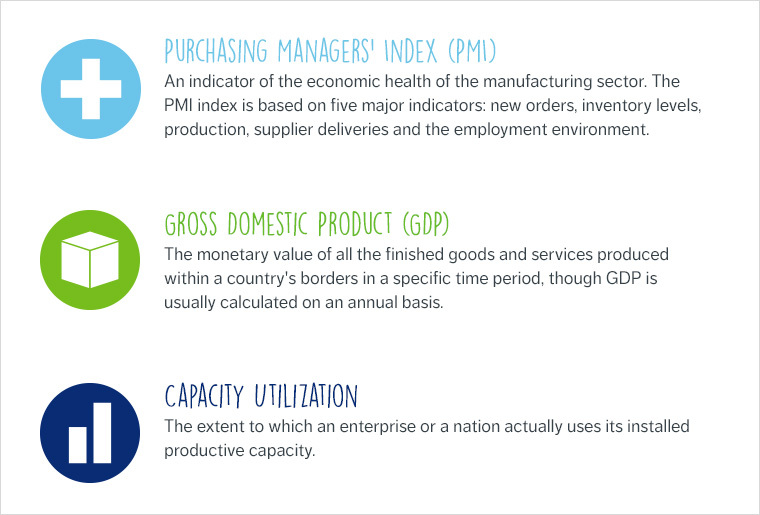 The PMI that is generated by The Institute for Supply Management (ISM) is a commonly used indicator of economic strength in the manufacturing sector. This data has been tracked for decades. For 2014 the US has averaged 55.8– the best full year since before the 2008 recession. This is a positive economic indicator. We generally want to see this above 50%. Another key indicator I track is Capacity Utilization specifically for the Manufacturing Sector. This data comes out monthly via the Federal Reserve Board. When the utilization of capacity in shops goes up, it indicates there is a lot of work out there. My US waterjet customers are typically doing really well when capacity utilization numbers hit the high seventies. The number for 2014 through December is 78.4%, which is very good. Capacity utilization hit 63% at the valley of the recession in 2009. Sure, a strong Capacity Utilization number is good for a company like Flow who makes waterjet equipment, but it is also really good for my customers because their shops, on average, tend to be loaded with more work, their overhead is fully absorbed, they’re hiring, and they’re growing. The magic number to exceed is 80%, which basically means a lot of shops can’t keep up with the equipment they have on their floor. Of course, some companies do well in times of national or global recession and others have trouble in times of growth. For example, growth in the automotive industry doesn’t necessarily help a custom countertop business, or gasket sales don’t necessarily go up as the housing market strengthens. In general, when the macroeconomic indicators are good there is opportunity out there. I seem to be hearing that the big levers moving the global manufacturing economy are petroleum prices, automotive sales, housing starts (especially in the US where it had gone down so far in 2009-11), and the tendency for industrialized countries to re-shore work. We will see. Right now all of these indicators have more positive to them than negative. Not everyone thinks so, though. As we move away from industrial production, Caterpillar recently announced a poor outlook for their large construction equipment business, which has historically been a reasonable indicator of overall global economic strength. Time will tell, but getting used to the macro indicators can help you plan your growth. Below are a summary of additional links I think you might find useful if you want to dig deeper. Industry Week‘s summary of MAPI’s forecast. Forbes wrote a useful article on US offshoring. Wall Street Journal article on US factory optimism. BusinessWeek article on global forecast for 2015. MAPI’s manufacturing activity report for January 2015. I wish you good luck in the coming year. Let me know what you think in the comments below. And as always, suggest ideas for future topics. Great Blog! Really useful info!